↑ Gordie Howe (2014). Mr Hockey: The Autobiography Of Gordie Howe. Penguin Canada. पृ॰ 31. आई॰ऍस॰बी॰ऍन॰ 978-0-14-319280-0. ↑ "Players: Gordie Howe Biography". Hockey Hall of Fame. अभिगमन तिथि १२ जून २०१६. ↑ Dryden, Steve (1998). The Top 100 NHL Players of All Time. Toronto: Transcontinental Sports Publishers. पपृ॰ 26–32. आई॰ऍस॰बी॰ऍन॰ 0-7710-4175-6. ↑ > MacSkimming, Roy (2003) . "1". 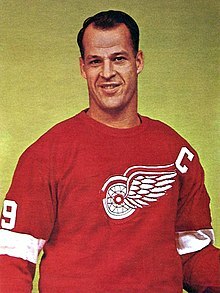 Gordie: a hockey legend (2nd संस्करण). Canada: Greystone Books. पृ॰ 14. आई॰ऍस॰बी॰ऍन॰ 1-55054-719-4.